I often hear Christians very proudly say that God sunk the Titanic, because days before its first voyage a White Star Line employee boasted ‘God himself could not sink the ship.’ I have heard even seasoned preachers and pastors with years of experience in ministry shouting the same from roof tops. I strongly disagree and here’s why? At church we preach that God is a loving God that died in our place so that we shall have everlasting life, (John 3:16). Then we come home and tell our children that the same God sunk Titanic because its makers mocked Him. Which one of these are they more likely to believe? At church we preach that thief comes only to steal, kill and destroy but Jesus came to give life and give it more abundantly, (John 10:10). Then we come home and tell our children that the same God sank Titanic and killed 1,517 passengers because its makers mocked him. Does God give life to a chosen few and take it away from others? In the church we preach that God is merciful and compassionate; slow to get angry and filled with unfailing love, (Psalm 145:8). Then we come home and tell our children that the same God like a quick tempered – spoiled brat, snapped a passenger liner worth $400 million, killed more than 1,500 passengers and left the survivors in shock and misery for the rest of their lives, just to prove that He cannot. Which one of these are they more likely to believe? 4. If God didn’t sink it then who did? A. Human error (Proverbs 14:12) – The Ship sunk within 2 hours leaving rescuers with little or no time to take action. Modern research has found that a structural engineering error caused the ship to sank so quickly. B. 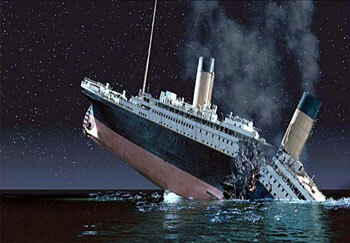 Poor planning (Proverbs 21:5) – The Ship had a maximum capacity of 3,327 passengers and crew. But it had only 20 lifeboats. Those life boats could carry only 1,178 people. On the night the Ship sunk there were 2,223 passengers on board. Only 16 lifeboats were utilized and at least 2 submerged as people rushed to jump on-board. C. Ignorance (Proverbs 22:3) – Edward Smith, the Captain of the Titanic was drunk and did not heed the warnings about the iceberg en route. 5. Why did God allow them to die? We do not know. But we do know that God loves us and has promised to save us when we call upon His name, (Romans 10:13). May be some of the survivors actually cried out to God and He indeed came to their aid. What matters most is not why God allow those who died to die? But whether or not we know His love? Because when we are truly in love with Him we shall not fear death, (1 John 4:18). Not even death can separate us from His love, (Romans 8:38-39). Please correct the spelling to stealing. You have said steeling in your sub title.